Ophir’s series of power meters use an array of software solutions in order to bring out maximum performance levels from their smart sensors. These unique software solutions offer extensive graphic displays of data, advanced measurement processing, and data logging capabilities for future review. Ophir also provides system integrator solutions to easily incorporate devices into larger end-user applications. All Ophir devices support one or two forms of communication with a PC including an RS232, USB, GPIB, or Bluetooth. 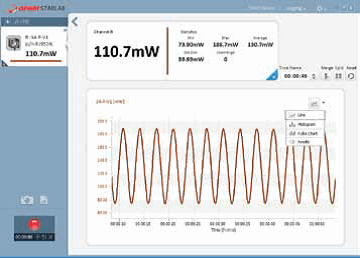 Types of Ophir software include the StarLab, StarCom, and LabVIEW solutions. The Software and System Integrator Solutions Catalog covers the different types of software and integrator solutions, and presents diagrams of their display characteristics and other specifications. Download the full catalog for more information.